It's a scavenger hunt at the circus! Click here to play! You'll need to collect a number of different symbols under the big top. If you're successful you'll find yourself collecting quite a bit of cash! The item at the top of the list is the gold bars. Be sure try to find as many of these symbols as you can. Not only will you multiply your line bet up to 10000 times, but it acts as a wild symbol and will replace all other symbols to help you create more winning combinations. Next on the list is the silver bell. Find two to five of these at the circus and you'll get up to 2000 times your line bet. You'll also want to keep an eye out for champagne glasses. This bubbly will get you up to 1000 times your line bet. There are plenty of other symbols on the list to collect that will see you bringing in some pretty impressive wins. No scavanger hunt at the circus would be complete without a clown. This jovial character acts as a scatter. 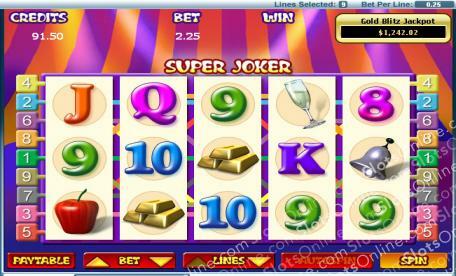 Spin two to five and you will multiply your total bet up to 100 times. Three or more will also trigger a bonus feature that will see you getting a chance at even more money. Get ready for a unique adventure at the circus that will see you collecting items for a chance at cold hard cash! The smiling clown acts as a scatter. If you can spin two to five, you will multiply your total bet by 2, 5, 20 or 100 respectivley. Three or more will trigger a bonus feature. The golden bars act as a substitute. They will replace all other symbols except scatters to help you create more winning combinations. Spin two to five and you could get up to 10000 times your line bet. If you can spin three or more clowns anywhere on the board, you will trigger a bonus feature. You will have to choose 3 out of 5 cards to find the Joker. Every time you get the Joker you will get 1000 times your triggering bet. IF you don't get the Joker you will get 2 times your triggering bet.